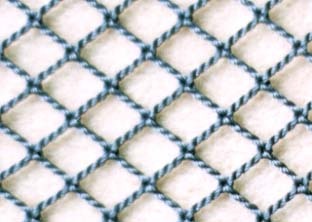 Raschel knotless netting is available in nylon polyester and polyethylene. Raschel net meshes are woven together instead of the traditional knotted process. Available in a variety of sizes. From 3/16" str to 3". Rope thickness from 210d/2 to 210d/306 depending on type please call for details. Fish farming cages (salmon), seine net, trawl net. Other applications include agricultural and industrial application such as insect and bird protection net, safety net, cargo net, sport net (hockey, golf, etc. ).